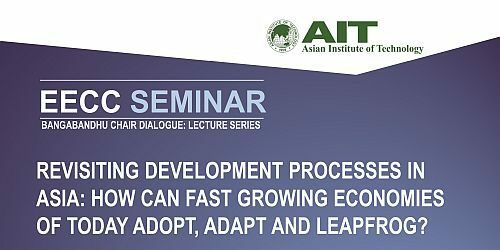 A seminar on "Revisiting Development Process in Asia: How can fast growing economies of today adopt, adapt and leapfrog" will be delivered by Dr Bindu Lohani, Distinguished Adjunct Faculty and Member, AIT Board of Trustees on 13 February 2019 from 13:30-15:00 hours at the Video Teleconference Room, AIT Library.This is the first event under the Bangabandhu Chair Dialogue: Lecture Series. Dr. Lohani is the President of The Resources Centre (TRC), Nepal. He is also a distinguished adjunct faculty and board member of the Asian Institute of Technology. His other responsibilities includes; Global Head of Climate Change Practices and Distinguished Fellow, Emerging Markets Forum, The Centennial Group, USA; Board of Trustees of Institute of Global Environmental Strategies (IGES, Japan); Founding Board member Asian Water Council (Korea); Chairman of Board, Clean Air Asia (Phi);Sustainability Advisory Council, Ingersoll Rand (USA); Advisory Board, Asia Pacific Center for Environmental Law (Singapore) and engaged in several other advisory think tanks and Boards. Dr. Lohani was formerly the Ranking Vice-President of the Asian Development Bank (ADB) for Knowledge Management and Sustainable Development and Vice-President for ADB’s Finance and Administration prior to that. Dr. Lohani holds a Doctoral degree in Engineering. He is an elected member of the National Academy of Engineering (NAE) of United States, a Diplomate of the American Academy of Environmental Engineers and a Fellow of the American Association for the Advancement of Science (AAAS). Asia’s growth in the past four decades has been remarkable. Asia is expected to grow at its fastest till mid century both economically and demographically. Especially there are low incoming nations which are aspiring to become middle income countries and the middle income countries to high income countries but are also facing number of socio-political and environmental challenges. History shows these are not new in the process of economic development but lessons learnt from other countries can give useful insights for newly emerging nations. Register: Kindly register your participation here to enable us to make better logistics.